The Sodality has now been meeting for eight months, and has had six meetings. Thus far a number of different forms of the Sodality’s Exercises have been employed, and there has been a degree of informality more generally in the structure of meetings. It was certainly the aim to experiment with a few formats, and to allow the Sodality slowly to discover and develop a true charism along with the most appropriate forms in which to express it. It now seems opportune to establish a more stable form for the Exercises, and a more concrete sense of the activities and aims of the Sodality. To these ends, a questionnaire was circulated on 19 July (following the Sodality’s last meeting) with the express intention of seeking the experiences and views of those who have attended the previous meetings. The answers have formed an important source of information in undertaking the work of finding a stable form for the Sodality and its monthly Exercises. The responses to the questionnaire would suggest that the majority of attendees are happy with the Sodality and see what it does as positive and something they wish to support. The following report summarises the answers that people gave, and makes a number of proposals in response. Q1 Are the Exercises too short / too long / just right? The general feeling was that the length of the Exercises was about right, although it would be helpful if there were a fixed finishing time. Proposal: That the meeting is officially scheduled for 19:30–21:00. Also, that a rota is established for setting up the tea after Exercises – a sensible time to leave would be at the end of the Allocution. This means, in practice, that the Exercises should be finished by 20:15 in order to give sufficient time for the discussion and refreshments to be served. This arrangement naturally affects the choice of prayers for the Exercises. Q2 Would you prefer Latin to be used mainly / partly / does not matter? There was a range of answers given, but most people expressed a desire to see a balance between Latin and English in the Exercises. Q3 When praying, would you prefer to sing more / say more? As with the question on Latin, above, respondents wanted to see a balance between sung and spoken prayer. Most people liked to sing, but nobody wanted the Exercises entirely sung. Proposal: That the Veni, Sancte Spiritus at the beginning and the Sub Tuum Præsidium at the end always be sung and thus form the sung part of the Exercises, with the prayers in between forming the spoken part. Q4 Would you like specific intentions to be collected / announced? This was a suggestion that met with real appreciation. Almost all those who answered the questionnaire thought it would be a positive development. Proposal: That intentions be announced before the En Ego in the form ‘The intentions to be prayed for … ’. If members of the sodality have any intentions they are to be given to the Prefect before the start of the exercises. Q5 Do you have any other views about the Sodality Exercises? A number of respondents asked only that the Sodality now establish stability both in the form of the Exercises and ultimately in form of its constitution. Several people specifically requested that in light of his imminent beatification, the Litany of the Passion of Cardinal Newman be used as a regular devotion. Proposal: That the Sodality Exercises reach a final form as described above, with the additional use of the Litany of the Passion of [soon-to-be Blessed] John Henry Newman. We recognise that in this final form the Exercises would reach their potential both in terms of being concise, but also in terms of the balance between Latin and English, and speaking and singing. Also, because of its peculiarly English and poetic nature, this Litany would thus emphasise the connexion between England and devotion to the Five Wounds. Q6 A change to the organisation of the discussions has been proposed – namely, that the Father Director choose his allocution subjects in advance, to enable people to prepare better and develop their questions in advance. Would this organisation be beneficial? Most respondents supported this suggestion. Proposal: That there be two terms, the first beginning in September and ending in December; the second beginning in February and ending in June or July. That a term card should be published giving a notice of dates, and the Father Director’s chosen topic/s for the term. A regular yearly event could take place in a specific month. A list of the major feasts for the Sodality should be incorporated into this term card. Proposal: That the Feast of the Exaltation of the Cross (14 September) be the occasion of an annual Mass for the Sodality. Proposal: That a list of principal feasts for the Sodality to celebrate be drawn up. This list is to include the Friday in the third week of Lent – the Feast of the Five Holy Wounds. Proposal: That Father Director nominates from proposals made by members an activity for the term, suggestions to be received by end of the preceding term. Proposal: That we nominate Officers for specific roles. Refer to the accompanying officer descriptions. Proposal: That a Constitution/Charter for the Sodality be drawn up. Q7 Would you come more / less than in the past? Although all the respondents were very enthusiastic about the Sodality, some commented that timing made attendance difficult. They would be more likely to come if they could get home at a reasonable time. Proposal: That regular attendance be made an obligation of membership of the Sodality (if this is possible). The proposal (see above) that the whole meeting be over by 21.00 should help to facilitate the observance of this obligation. Q8 It has been proposed by Father Andrew that it becomes obligatory on all members to recite the Chaplet of the Five Wounds and the prayer En ego every day. Would this be too demanding / not demanding enough for you? There was no objection to this idea, although some pointed out that this might well be sufficient in terms of daily obligations. Other devotions might be encouraged without being obligatory. Examples given include reciting the Litany of the Precious Blood on Fridays. Proposal: That it be a daily obligation for members of the Sodality to pray the En Ego and the Chaplet of the Five Holy Wounds. Proposal: That the Sodality prayers be listed on the term card, and that a Manual be designed with all the suggested additional prayers for members. Q9 Are there any other obligations you would be willing to adopt? Q10 Are there any concrete practical proposals for external works that the Sodality might undertake, such as pilgrimages, supporting Catholic charities and other apostolates, or in terms of the corporal and spiritual works of mercy? There was wide support for annual pilgrimages. The range of suggestions, for other works included holding rosary vigils outside abortion clinics; supporting the work of other Catholic and pro-life organisations like the Good Counsel Network and Integrity & Action; support for Anglicans wishing to enter the fold, particularly under the new provisions from Rome; prayer campaigns for various causes, and so on. Proposal: That Father Director nominates from the proposals an activity for the term, suggestions to be received by end of the preceding term. Proposal: That the first pilgrimage be to Tyburn to see the site of the martyrdom of so many English saints. This is currently being organised and other pilgrimages will be organised in future, especially where they have a relationship to the Pilgrimage of Grace. Proposal: That we give support particularly to Catholic pro-life lobbying groups, and to traditional groups currently organising projects to give aid to the homeless. We trust that this report represents the views of the majority of people. It is also hoped that the proposals will meet members’ needs and will also encourage and increase attendance. 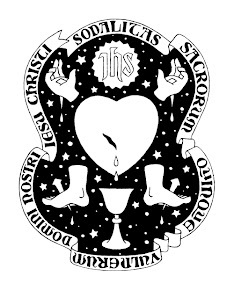 Certainly, putting the above proposals into effect will help towards a stable format for the Sodality, and members can then begin the next stage of developing both their personal devotion to the Five Wounds and external works of mercy according to the spirit of the Sodality.